SEPTEMBER 20 - 26, 2017 UCW 57 WWW.UPANDCOMINGWEEKLY.COM Best Vet/Animal Hospital Reilly Road Animal Hospital 695 S. Reilly Rd. (910) 864-0606 or www.reillyroadanimalhospital.com Pets become a part of the family faster than they can run circles around you the second you enter the door. And at Reilly Road Animal Hospital, they know that family deserves qual - ity, trustworthy care. The hospital has served our community for 27 years. Dr. Bentley Stephenson, the owner, treats all shapes and sizes of Fayetteville's pets as a licensed veterinarian. He takes your pets' health seriously and will do whatever it takes to keep them well. "We strive to provide the best veterinary care while also providing the care and compassion that all pets deserve," a staff member said. According to the hospital's website, the mission of the hospital is "to fulfill the needs of our clients by providing quality pet health care services through a responsive and professional staff with the emphasis on individual attention and commitment to our clients, their pets and our community." The staff also per - forms veterinary care for local animal shelters and rescue groups to enable these animals to be adopted and find a new home. 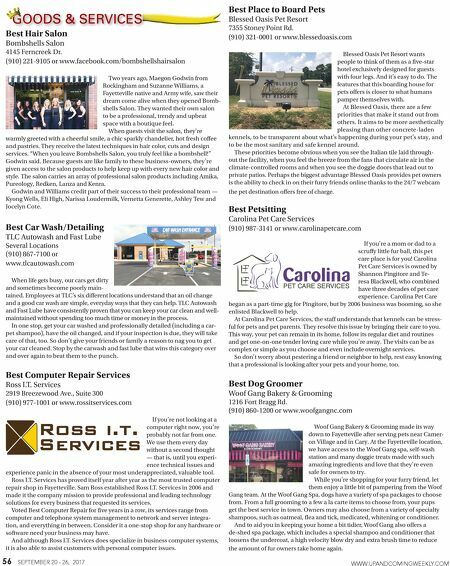 The honor to be named the best of Fayetteville is weighty — the hospital's mis- sion statement includes that the "highest compliment" it could receive is a word- of-mouth referral from current patients. 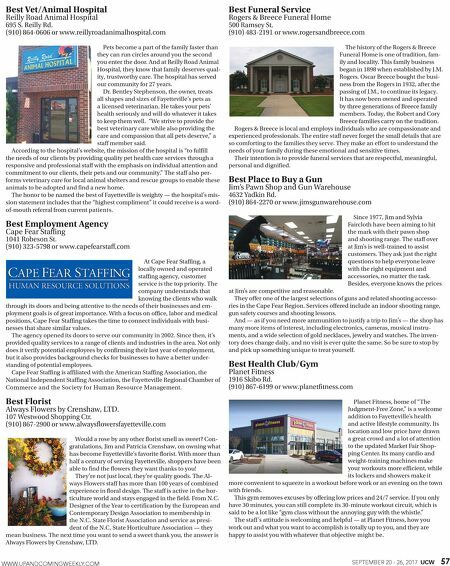 Best Employment Agency Cape Fear Staffing 1041 Robeson St. (910) 323-5798 or www.capefearstaff.com At Cape Fear Staffing, a locally owned and operated staffing agency, customer service is the top priority. The company understands that knowing the clients who walk through its doors and being attentive to the needs of their businesses and em - ployment goals is of great importance. With a focus on office, labor and medical positions, Cape Fear Staffing takes the time to connect individuals with busi- nesses that share similar values. The agency opened its doors to serve our community in 2002. Since then, it's provided quality services to a range of clients and industries in the area. Not only does it verify potential employees by confirming their last year of employment, but it also provides background checks for businesses to have a better under - standing of potential employees. Cape Fear Staffing is affiliated with the American Staffing Association, the National Independent Staffing Association, the Fayetteville Regional Chamber of Commerce and the Society for Human Resource Management. Best Florist Always Flowers by Crenshaw, LTD. 107 Westwood Shopping Ctr. (910) 867-2900 or www.alwaysflowersfayetteville.com Would a rose by any other florist smell as sweet? Con- gratulations, Jim and Patricia Crenshaw, on owning what has become Fayetteville's favorite florist. With more than half a century of serving Fayetteville, shoppers have been able to find the flowers they want thanks to you! They're not just local, they're quality goods. The Al - ways Flowers staff has more than 100 years of combined experience in floral design. The staff is active in the hor- ticulture world and stays engaged in the field. From N.C. Designer of the Year to certification by the European and Contemporary Design Association to membership in the N.C. State Florist Association and service as presi - dent of the N.C. State Horticulture Association — they mean business. The next time you want to send a sweet thank you, the answer is Always Flowers by Crenshaw, LTD. Best Funeral Service Rogers & Breece Funeral Home 500 Ramsey St. (910) 483-2191 or www.rogersandbreece.com The history of the Rogers & Breece Funeral Home is one of tradition, fam- ily and locality. This family business began in 1898 when established by J.M. Rogers. Oscar Breece bought the busi- ness from the Rogers in 1932, after the passing of J.M., to continue its legacy. It has now been owned and operated by three generations of Breece family members. Today, the Robert and Cory Breece families carry on the tradition. Rogers & Breece is local and employs individuals who are compassionate and experienced professionals. The entire staff never forget the small details that are so comforting to the families they serve. They make an effort to understand the needs of your family during these emotional and sensitive times. Their intention is to provide funeral services that are respectful, meaningful, personal and dignified. Best Place to Buy a Gun Jim's Pawn Shop and Gun Warehouse 4632 Yadkin Rd. (910) 864-2270 or www.jimsgunwarehouse.com Since 1977, Jim and Sylvia Faircloth have been aiming to hit the mark with their pawn shop and shooting range. The staff over at Jim's is well-trained to assist customers. They ask just the right questions to help everyone leave with the right equipment and accessories, no matter the task. Besides, everyone knows the prices at Jim's are competitive and reasonable. They offer one of the largest selections of guns and related shooting accesso - ries in the Cape Fear Region. Services offered include an indoor shooting range, gun safety courses and shooting lessons. And — as if you need more ammunition to justify a trip to Jim's — the shop has many more items of interest, including electronics, cameras, musical instru - ments, and a wide selection of gold necklaces, jewelry and watches. The inven- tory does change daily, and no visit is ever quite the same. So be sure to stop by and pick up something unique to treat yourself. Best Health Club/Gym Planet Fitness 1916 Skibo Rd. (910) 867-6199 or www.planetfitness.com Planet Fitness, home of "The Judgment-Free Zone," is a welcome addition to Fayetteville's health and active lifestyle community. Its location and low price have drawn a great crowd and a lot of attention to the updated Market Fair Shop - ping Center. Its many cardio and weight-training machines make your workouts more efficient, while its lockers and showers make it more convenient to squeeze in a workout before work or an evening on the town with friends. This gym removes excuses by offering low prices and 24/7 service. If you only have 30 minutes, you can still complete its 30-minute workout circuit, which is said to be a lot like "gym class without the annoying guy with the whistle." The staff 's attitude is welcoming and helpful — at Planet Fitness, how you work out and what you want to accomplish is totally up to you, and they are happy to assist you with whatever that objective might be.